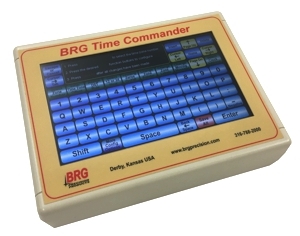 BRG's 689 series allows you to change the color of any zone or zones with ease. A USER CHANGEABLE COLOR option is now available on all 689's for an additional $75. Also, a new GUI touch screen IR remote control, with built in help screens, is available for time zone clock reconfiguration. 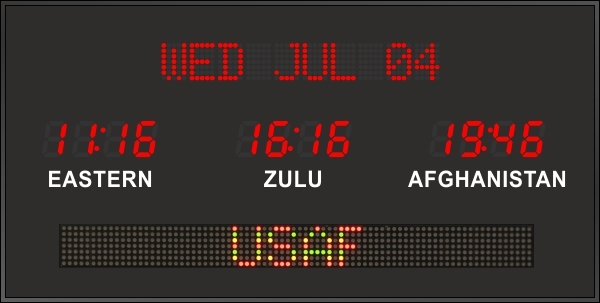 The 689 series time zone clocks features a Dot Matrix LED date, bar-segment LED time displays with white vinyl zone label below & a 7 color moving message display. 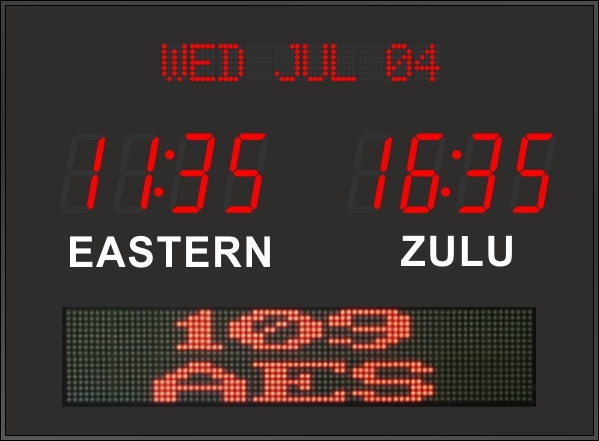 The message displays feature either a 2 inch or 4 inch variable font character. In many 689 models, the clock can display up to 8 time zones at once. The date can be arranged in any format and can include Julian dates. For instance, you could have 14 APR 09 or FRI APR 14. For easy clock management, an infrared (IR) remote control is included with every 689 model. 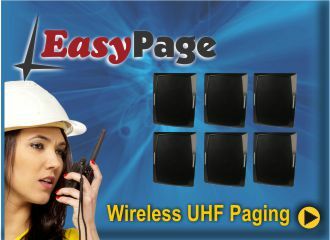 You can specify a radio (RF) remote, if preferred for no additional charge. Every 689 model includes your choice of an Ethernet or USB interface for easy time zone parameter control. 689B-B18R 2 zone, fixed zone, time zone clock. It has optional 1.8" Blue LEDs for the time and standard 1.2" red dot matrix LEDs for the date and a single line moving message display. 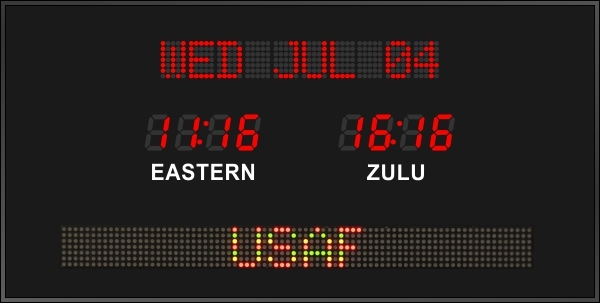 689N-RL-TS 4 Zone Clock with 2.5 " LEDs for time, 2.0 ", 20 character Dot Matrix LEDs for the date. 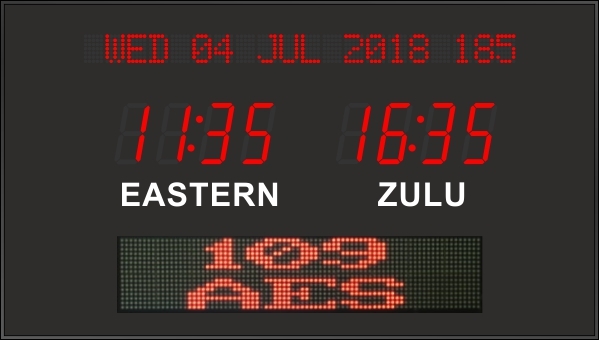 This clock has the oprtional 1.0" removable white vinyl labels and optional temperature sensor that displays the current temperature in the far right of the date line and a single line 36" moving message display.